On 1 May 2018 the International Service for Human Rights (ISHR) published its 2017 annual report (“Time for ambition, cause for hope”), outlining its impacts during 2017 and vision for 2018 and the years ahead. Through its Human Rights Defender Advocacy Programme, ISHR helped defenders from across the world develop networks of support and influence, build energy and resilience, and become even more effective advocates for national-level change. In consultation with LGBTI persons and organisations from all regions, and with input from eminent legal experts from across the world, ISHR developed and launched the Yogyakarta Principles Plus 10. Following a three year campaign undertaken in partnership with the Burkina Faso Coalition of Human Rights Defenders and the West African Human Rights Defenders Network, in June ISHR secured the adoption of a national law on the protection of defenders in Burkina Faso. 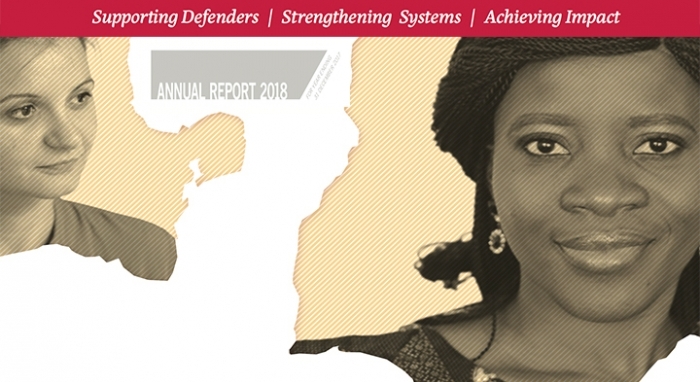 ISHR provided human rights defenders with international and regional advocacy platforms by supporting them in giving evidence and testimony at the Human Rights Council in Geneva and the African Commission on Human and Peoples’ Rights in Banjul. ISHR provided defenders with comprehensive and practical guidance to leverage the UN, with a new manual on engaging with the Third Committee of the General Assembly in English, Spanish and French, and a fully revised manual on navigating the UN Committee on NGOs in Arabic, Spanish, French and English. ISHR also provided defenders with access to the most up-to-date information and advice via social media in Chinese, French, English and Spanish. We’ll leverage the 20th anniversary of the Declaration on Human Rights Defenders to strengthen the recognition and protection of human rights defenders under international and regional law, and through the development and effective implementation of corporate policies on defenders. (eg, https://humanrightsdefenders.blog/2018/04/17/20th-anniversary-un-work-on-human-rights-defenders-assessed-by-ishr/) We’ll ensure that national mechanisms for the protection of defenders are adapted and respond to the particular risks faced by women human rights defenders. Our Human Rights Defender Advocacy Programme will substantially strengthen the skills, networks, resilience and impact of defenders working on women’s rights, LGBTI rights and in restrictive environments. Additionally we’ll provide human rights defenders from across the world with an innovative online e-learning platform, giving them access to training and tactical support and linking them with a community of practice and solidarity. And through our Human Rights Defender Fellowship Programme, we will provide at least three defenders at risk with up to six months of intensive training and strategic advocacy support. This entry was posted on	May 2, 2018 at 17:37	and is filed under books, Human Rights Defenders, ISHR.